How many countries in the world have a Sikh community that is so committed to bringing different people together that they would invite a Pakistani Muslim to speak on their most religious holiday? The founding fathers would have been pleased to see that their dream of a religiously pluralistic America is still of the utmost importance in their own country today. Since its founding, Sikhs have had a long history with Muslims: both positive and negative. While Sikhs were persecuted by several of India’s Muslim (Mughal) rulers (particularly Jehangir, Shah Jahan, Aurangzeb) from the 16th through 18th centuries, and other Muslim invaders to India afterwards, many Muslims closely allied themselves with the Gurus and Sikhs as well. 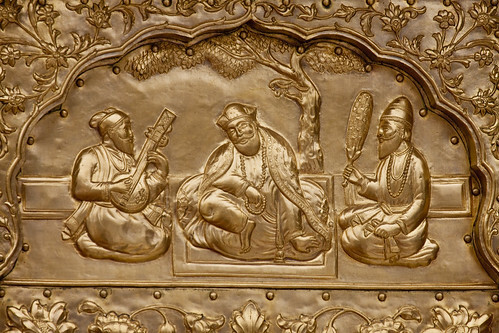 One of Guru Nanak’s first followers was Bhai Mardana, a Muslim who accompanied the Guru on his treks across the Indian subcontinent and played the rabab (a stringed instrument played with a bow or plucked) to Guru Nanak’s compositions. There are many other such examples throughout Sikh history. Even the Guru of the Sikhs today, the Guru Granth Sahib, includes compositions by Muslims (and Hindus) alongside those of the Sikh Gurus. So was Guru Nanak’s focus on universal truths and spirituality that he was highly regarded by both Hindus and Muslims. It’s nice to see that this universality is still expressed today.